"Punch Taverns - The Pub Goers New Friend?" 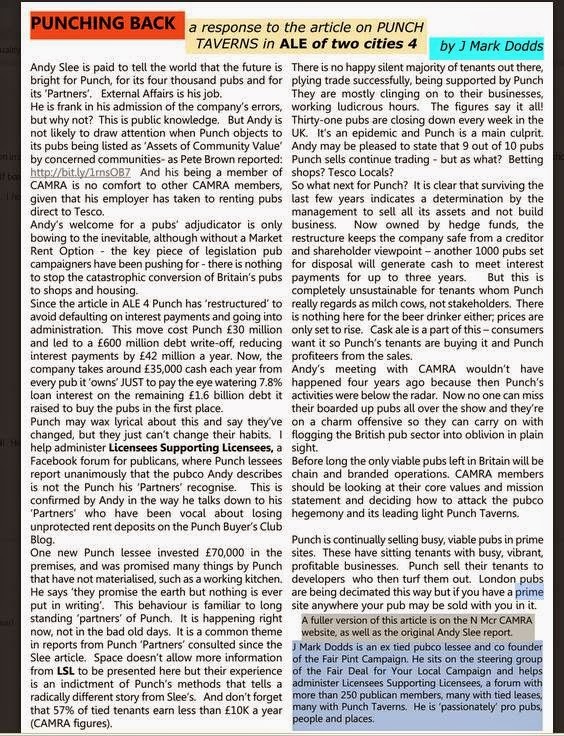 Andy Slee is paid to tell the world the future is bright for Punch Taverns, for its four thousand pubs and for its ‘Partners’. External Affairs is his job. Why would Andy not be frank in his admission of his company’s past errors? Many of them have been reported widely in the press – and are plain to see in the boarded up and converted pubs his company has starved of cash, run into the ground and sold for alternative use all over Britain - in the last five years. Would Andy be as likely to draw attention to the fact that Punch has been objecting to its pubs being listed as ‘Assets of Community Value’ by concerned communities? As Pete Brown reported here: - where Punch say pubs don’t “further the social well being or social interests of the local community”. And Andy being a member of CAMRA should be of little comfort to other CAMRA members considering that his employer has taken to renting pubs direct to Tesco. Andy’s welcoming of a pubs’ adjudicator is only bowing to the inevitable. However without a Market Rent Option (MRO) - the key piece of legislation people who want to protect pubs have been pushing for - there is nothing upcoming to stop the continuing catastrophic conversion of Britain’s pubs to shops and housing from gathering pace. Since last month’s article by Robin Bence in NW Manchester CAMRA magazine Punch has ‘restructured’ to avoid defaulting on interest payments and going into administration. ‘Restructuring’ cost Punch £30 million and led to a £600 million debt write-off reducing interest by £42 million a year - leaving Andy working for a company still taking around £35,000 cash each year from every pub it ‘owns’ JUST to pay the eye watering 7.8% loan interest on the remaining £1.6 billion debt it raised to buy the pubs in the first place. Punch may wax lyrical about the situation and say they’ve changed but they can’t change their habits. I help administer Licensees Supporting Licensees, a Facebook forum for publicans, where Punch lessees report unanimously that the Punch Andy describes is not the Punch his ‘Partners’ recognise. This is confirmed by Andy in the way he talks down to his ‘Partners’ who have been vocal about losing unprotected rent deposits on the Punch Buyer’s Club Blog. I’m writing having just left a Punch pub that was recently taken on by a new Lessee. He invested £70,000 in the premises (typical level of investment in a ‘low cost entry’ into the pub sector), was promised many things by Punch that have not materialised. Such as a working kitchen. He says ‘they promise the earth face to face but nothing is ever put in writing, then they change the deal they offered you the last time you saw them’. This behaviour will be as familiar to new lessees as it is to long standing Punch ‘partners’. It is happening right now, not just in the bad old days. It is a theme common in reports from Punch’s ‘Partners’ consulted since the Slee article. Space doesn’t allow more information from LSL to be presented here but their experience is an indictment of Punch’s methods that tells a radically different story from Slee’s. And, by the way, don’t forget that 57% of tied tenants earn less than £10K a year (CAMRA figs). There is no happy silent majority of tenants out there, plying trade successfully, being supported by Punch – they are mostly clinging onto their businesses working ludicrous hours – for heaven’s sake the figures say it all! 31 pubs are closing every week, all over the country. It’s an epidemic and Punch is a main culprit. Andy may be pleased to state that 9 out of 10 pubs Punch sell continue trading - but as what? Betting shops? Tesco Locals? So what next for Punch? What is clear that surviving the last few years indicates a determination by the management to sell all its assets and not build business. Now owned by hedge funds the restructure keeps the company safe from a creditor and shareholder viewpoint – another 1000 pubs set for disposal will generate cash to meet interest payments for up to three years. But the situation is completely unsustainable for tenants who Punch obviously regards as milk cows not stakeholders. There is nothing here for the British Beer Drinker either; prices are only set to go up. Cask ale is a part of this – consumers want it so Punch’s tenants are buying it and Punch profiteers from the sales. Andy’s meeting with CAMRA wouldn’t have happened four years ago because back then Punch’s activities were below the radar. Now no one can miss their boarded up pubs all over the show and they’re on a charm offensive so they can carry on with flogging the British pub sector into oblivion in plain sight. Before long the only viable pubs left in Britain will be chain and branded operations. So as Andy is willing us to believe that it isn’t business as usual, when clearly it is, CAMRA members should be looking at their core values and mission statement and deciding how to attack the pubco hegemony of which Punch is a pioneering part. The figures below are extracted from Punch’s own accounts. Included in these sales Punch is continually selling busy, completely viable pubs in prime sites. The pubs have sitting tenants with busy, vibrant, profitable businesses. Punch sell their tenants to developers for multiple £ millions who then turf them out. London pubs are being decimated this way but if you have a prime real estate site elsewhere your pub will be sold with you in it, whether you like it or not. The above don’t include ‘Churn’ – business failure - where a publican’s business fails, the tenant leaves and the pub stays open, run by a ‘Holding Company’ until re-let to the next tenant who will invest in the building as a ‘low cost entry’ into the pub trade. There is no reliable data for churn numbers. The pubco’s deny Churn is an issue yet the pub holding company business is booming -Google it. LSL reckon from observation that around 15% of the national estate, including Punch, is under temporary management waiting for new tenants at any given time. Turns out that the Punch Taverns pubs he says have access to 69 breweries actually have access to only 12 (TWELVE that is NOT SIXTY NINE) brewers at a time and after sixteen weeks the range changes to a different 12 brewers so, nothing like Slee's exaggeration at all and THEN: This choice is only available to publicans who have Casque Mark status zany that costs £300 a year which, given a Tied tenant's earnings of £10K a year, presents quite a bar to entry to the Punch Cask Ale Cornucopia Slee is so keen to brag about.. Some good comments here. Danimal has the measure of the situation - It is called the Great British Pubco Scam - pubco's are flogging pubs for alternative use all over the country, as fast as they can. Punch say it's just selling 'sadly no longer economically viable units' (shorthand for pubs they've run into the ground) as they asset strip and churn tenant after tenant through their premises with high rent and wholesale prices that are up to double what their publicans would pay on the open market. This makes the pubs unprofitable as the pubco's take all the profit. The pubs get run down, the pubco's flog them off. Andy Slee is Punch Tavern's External Affairs Director. He was interviewed recently by a CAMRA magazine and made out that all Punch wants to do is be nice to pubs and people and places. It's not true - as cases like this prove. Every day Punch is shifting pubs off its balance sheet so they can pay interest on their gargantuan loans that make the company a Zombie and all its pubs charge the general public a quid a pint more than they should be paying. The scam has to be stopped. Purely on pricing you seem to be comparing Punch's list price with GK's discounted price. shows the £100 or £160 per barrel (£30 or £49 per 11 gall) discount that PBC tenants receive off the list price. I thought that you were going to post invoices demonstrating your (flawed) assertion that tied tenants pay 2x FOT prices.